Actinomycetes have been a major supplier of natural products (Huck et al. 1991; Lee and Hwang 2003). In particular, Streptomyces is a prolific producer of versatile structures of antibiotics. Most of antibiotics developed for agricultural uses including pesticides were isolated from Streptomyces strains (Tanaka and Omura 1993). 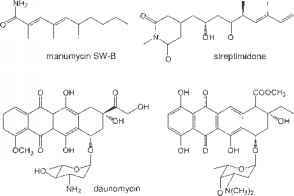 Among antifungal antibiotics recently discovered from Streptomyces spp., polyketide-spiroketal spirofungins, macrolide cineromycins, and oligo-mycin A, antimycin type kitamycins, aflatoxin inhibitor aflastatins, aminoacetophenone family heptaene antibiotics, and novel nikkomycin analogs were found to have potent antifungal activity (Bormann et al. 1999; Hayashi and Nozaki 1999; Holtzel et al. 1998; Kim et al. 1999b; Ono et al. 1998; Schiewe and Zeeck 1999; Vertesy et al. 1998). Streptomyces have the ability to synthesize diverse compounds covering the chemical structures generated by the eukaryotic organisms such as fungi, algae, and plants. Streptomyces kurssanovii was found to have the ability to synthesize fumaramidmycin, which is structurally very similar to fumarimid and coniothriomycin produced by the fungi Sordaria sp. and Conithyrium sp. (Maruyama et al. 1975). Although the frequency of rediscovery of known compounds is relatively high, it should also be noted that Streptomyces strains continue to provide a larger number and wider variety of new antibiotics than any other microbial sources (Okami and Hotta 1988). Many macrolide antibiotics, for example, have already been introduced from a variety of Streptomyces spp., however, new macrolide compounds are still being discovered to be potent antifungal agents. Faeriefungin, a polyene type macrolide, isolated from S. griseus showed strong in vivo activity against asparagus (Asparagus officinalis L.) pathogens Fusarium oxysporum and Fusarium moniliforme (Smith et al. 1990). More recently, the antifungal substances, phenylacetic acid and sodium phenylacetate, active against Phytophthora capsici and M. grisea were isolated from the culture filtrates of S. humidus (Hwang et al. 2001). Streptomyces is a sole microbial source for a certain type of antibiotics such as members of manumycin type that contain a multifunctional mC7N unit as a central structural element. A manumycin type antibiotic SW-B has recently been purified from the culture of Streptomyces flaveus strain A11 (Hwang et al. 1996). The strain was isolated from cave soil in Korea by an extensive screening program for the Streptomyces strain antagonistic to P. capsici. The structure of manumycin SW-B was determined to be 2,4,6-trimethyl deca-(2E,4E)-dienamide (molecular formular C13H23NO) with the molecular weight of 209.178 (Figure 2). SW-B showed a high level of inhibitory activity and broad antifungal spectrum against several plant pathogenic oomycete and fungi such as P. capsici, M. grisea, Colletotrichum cucumerinum, and Alternaria mali. Hyphal growth of P. capsici and M. grisea was inhibited by more than 50% at 10 mgml"1 and by 90% at 50 mg ml"1. The simplicity of the chemical structure and its broad antifungal spectrum provide the possibility as a lead compound for fungicide development. Since rare actinomycetes have the properties such as slow growth, poor sporulation, and instability in preservation, it seems difficult to isolate them without applying the selective isolation methods. Most of their metabolites, therefore, were not subjected to the antifungal screening. However, although the antifungal agents from these non-Streptomyces groups of actinomycetes have not yet been developed into commercial fungicides, they are expected to be useful microbial sources for diversifying chemical library of metabolites. The genus Micromonospora, only a minor component in the actinomycete population in soil, has been recognized as one of the important sources for antimicrobial metabolites. Figure 2 Potential antifungal leads from microbial sources. 100 mgml21, at which the commercial fungicides showed similar control efficacy against the diseases. No phytotoxicity was observed on any of the host plants at the concentrations of 500 mgmr1. Recently, two structurally related compounds isolated from rare actinomycetes were found to have potent antifungal activity against plant pathogenic fungi. Daunomycin and spartamycins were isolated from Actinomadura roseola and Micromonospora spartanea, respectively (Kim et al. 2000b; Nair et al. 1992). Both compounds have similar anthracycline aglycone moiety attached to one or three glycosides (Figure 2). 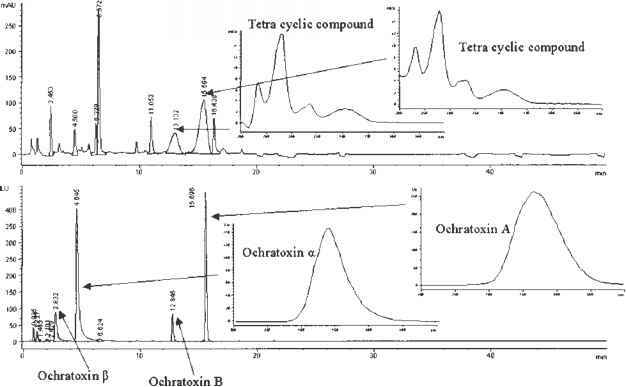 Daunomycin noted for anticancer activity showed substantial in vitro antimicrobial activity against P. capsici, R. solani, B. cinerea, Cladosporium cucumerinum, Cylindrocarpon destructans, D. bryoniae, S. cerevisiae, and Gram positive bacteria. In particular, daunomycin showed strong inhibitory effect on the mycelial growth of P. capsici and Phytophthora development on pepper plants. In vivo efficiency against Phytophthora infection in pepper plants was somewhat less effective than that of the commercial fungicide metalaxyl. Pseudomonas aeruginosa strain B5 was isolated from pepper-growing soils in Korea, which showed substantial inhibitory activity against P. capsici and other plant pathogenic fungi. From the culture broth of the antagonistic bacterial strain B5, one of the antibiotic substances active against P. capsici was purified and identified as a glycolipid antibiotic rhamnolipid B (Kim and Hwang 1993). Rhamnolipids containing rhamnose and b-hydroxy-decanoic acid were first found in Pseudomonas pyocyanea (the old name of P. aeruginosa) (Bergstrom et al. 1946). Recently, complete nuclear magnetic resonance signal assignments of rhamnolipid B based on intensive spectral analysis provided the evidence of 1,2-linkage of 3-[3-[-l-rhamnopyranosyl-(1 ! 2)-a-l-rhamnopyranosyloxy] -decanoyloxy]-decanoic acid (Moon et al. 1996). The glycolipid antibiotic rhamnolipid B has the characteristic structure of biosurfactants, which is comprised of a hydrophilic portion (rhamnose moiety) and a hydrophobic portion (b-hydroxydecanoate moiety). The biosurfactant property was supposed to render the rhamnolipid the ability to intercalate into and to disrupt the zoospore plasma membrane, because zoospores are surrounded only by plasma membrane without typical cell wall (Stanghellini and Miller 1997). This hypothesis is well supported by the further finding that rhamnolipid B had no lytic activity on zoospore cysts surrounded with the cell wall (Kim et al. 2000a). In vitro growth inhibition assay performed in the microtiter dishes showed potent antifungal activities against Cercospora kikuchi, C. destructans, C. cucumerinum, Colletotrichum orbiculare, M. grisea, and P. capsici. In particular, rhamnolipid B had a high level of antifungal activity (10 mgmP1 of MIC) against P. capsici. In the microscopic study, most of the zoospores became non-motile in the presence of 25 mgml2 of rhamnolipid B, subsequently lyzing within 1 min after treatment. Rhamnolipid B also was effective in inhibiting the germination of zoospore and the hyphal growth of P. capsici. The average hyphal length of germlings at the 50 mgml-1 was reduced by 55% of that in the untreated control. These results suggest that rhamnolipid B has not only the lytic effect on zoospores of P. capsici but also inhibitory effect on the growth of the oomycete. Zoospores have been implicated in the spread of the oomycete pathogen through irrigation water and rainwater (Hwang and Kim 1995b; Ristaino et al. 1993). The lytic effect of rhamnolipid B on zoospores may provide a merit as a preventive control agent against phytophthora blight in pepper-growing fields, which eliminate and/or reduce zoospore density and long-distance dispersal of the pathogen. In the recirculating hydroponic cultural system of crops, rhamnolipid B has been demonstrated to be very effective in controlling the dispersal of plant diseases caused by zoosporic oomycete pathogens (Stanghellini et al. 1996). Bacillus subtilis is known to produce diverse antifungal peptides represented by inturins. A series of fungicidal metabolites, named rhizocticines, were identified from B. subtilis ATCC6633 (Figure 2) (Fredenhagen et al. 1995). These peptides showed control efficacy against B. cinerea on apples and vines in the greenhouse. The proteolytic digestion test of the compound revealed that L-2-amino-5-phosphono-3-(Z)-pentenoic acid was the actual structure active against B. cinerea. The antifungal activity was proven to be stereo specific, since the corresponding 3-(E) compound did not show any antifungal activity. The mixture of rhizocticines A, B, and D also showed control efficacy against gray molds on grapes in the field.